In general, an outdoor aviary is much better for birds than an indoor aviary. It provides more space, sunlight and fresh air which in turn help to improve a bird’s health and happiness. So if you’re considering buying an outdoor aviary or even building one then you’ve made the right choice. Typical birds that are housed in an outdoor aviary include the parrot, parakeet and the finch. 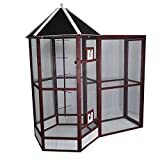 If you continue reading, below I’ve highlight the best outdoor aviaries that are available AND I’ve also written a guide containing all of the factors you need to consider before you make your purchase or start your build. Think about what your local weather conditions are going to be like in your country for an outdoor aviary and adapt accordingly. If it rains a lot and is cold then you may need an extended roof and an outdoor heater or basking lamp (especially in the winter if it snows). 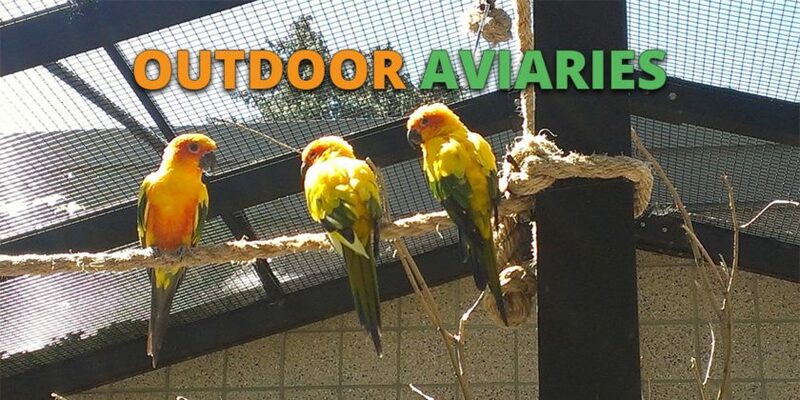 Sunny climates may require the aviary to have an extended roof or to be placed near a fairly large building or tree so there is shade to prevent overheating. Very dry climates may benefit from a mister or humidifier. Windy climates should have the aviary positioned near a wall or where there are natural wind breakers. If you live in an area with windy storms or hurricanes then check out our guide to looking after your pet birds during them, available here. You can look up the species of your pet bird on Wikipedia. Do this to find which country the species is native to. Then go to Weatherbase and look at what the average temperatures are throughout the year to see whether or not your own local climate is suitable. Because of the environmental conditions mentioned above, outdoor aviaries need to be made of much stronger materials when compared with indoor aviaries. 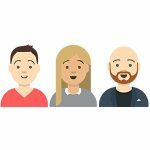 This means that they are typically made with rust proof metals or rot resistant wood which additionally comes with an extra layer of paint for protection. Metal is a stronger and more durable material to construct an aviary with and it requires less maintenance. Wood on the other hand can look more aesthetically pleasing and requires more work to keep up (as it may need to be painted every couple of years), however it is usually cheaper to buy. When buying an aviary, also watch out for cheaper aviaries that get sold as an outdoor aviary when in fact they are better suited to the indoors. Ensure your aviary mesh or netting is the correct size for the birds you intend to keep so that they are not able to chew and fit through through the gaps. This is particularly true for smaller sized birds such as finches and budgies which instead may need a finch cage or parakeet cage. When choosing aviary wire mesh, safe materials include stainless steel, aluminium or iron. Galvanized steel contains zinc which is poisonous to large birds if they chew on it a lot. If you must go with galvanized steel then it is safer to go with steel that is galvanized after welding. Consider using a concrete floor (more details below) if you’re experiencing problems with animals such as foxes trying to dig into your enclosure. You may want to consider trimming any nearby trees that will allow predators to access the roof of your aviary. This needs to be balanced out with ensuring your birds get enough shade if your climate is very sunny. Over at MyGouldianFinches they recommend using misting and fogging systems in the summer months to keep your birds cool. Install a two door safety entrance. Unlike single door entrances – a two door aviary entrance ensures that the aviary will always be sealed at all times and therefore escapes cannot happen due to a careless person entering the enclosure. Just don’t forget to make duplicate keys for the locks on these doors. Don’t place your aviary near any building vents, fans or mechanical devices such as air conditioning units as this will disturb your birds. If you want your pets to get a good nights rest then disable any motion or night light detectors that will wake up your birds. Consider the climate conditions (as mentioned above) and adjust the position of your aviary so it has enough sun or shade etc. Also consider how other features in your garden (such as water features) are going to affect the microclimate of your garden. Jim McKendry recommends being very considerate to your neighbors as birds can be noisey. Minimise this noise by placing the birds away from your neighbours house and consider surrounding the aviary with plants, trees and shrubs. Hiding your birds from the plain sight of a street is also a wise idea as it minimises the chance of thefts. It’s a good idea to have a discussion with your neighbours ahead of time about your building plans. Check the building codes in your home owners association, state or country. There may be specific rules that you have to comply with in order to make your aviary legal. When buying or building an outdoor aviary, it’s recommended that you lay down some type of floor. If you don’t then your birds will play around in the dirt and are likely to pick up a parasite. This is when you use some type of gravel or pebbles. You’ll want to be using gravel here that has fairly large stones, otherwise the birds may swallow the stones. 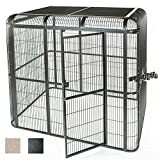 If you’re having issues with birds digging into the soft flooring or even predators trying to dig their way in, then you may want to consider adding a wire mesh to the aviary floor as well. Verdict: soft aviary flooring is fairly effective, easier to install and is more forgiving. Plus it’s fairly easy to move if you decide to change the location of your aviary. Hard aviary flooring is typically built with concrete, bricks or paving slabs. These materials are strong enough to prevent any bird or animal from digging into or out of your aviary. They also help make the aviary more steady. Some owners additionally like to lay a layer of sand on top of the aviary as well. Verdict: hard aviary flooring is much stronger and durable but it may also been more expensive to install and requires more effort to initially set up. Walk-in Safety Features – Comes with a walk-in safety door for extra escape protection which also makes cleaning easier. Easy access – Well positioned feeding and watering stations which means you don’t even have to enter. Spacious – 12 perches inside the aviary gives plenty of room for a number of birds. Huge and beautiful – Looks great and has tons of space for almost any bird. Super durable – Made from strong materials that that are powder coated and will last you for many years. High quality – this is professional level quality, the sort you’d see at national zoos. This is only a beginning list and I’ll soon be adding more outdoor aviaries. Please let me know in the comments below if you’d like a particular outdoor aviary to be reviewed. Alternatively, if you’re instead looking to build an aviary then check out the How to Build An Aviary guide that is available here where you can build at aviary at 80% of the cost of buying one.